Securall fully assembled Tornado Safe Rooms & Shelters are designed to be conveniently placed in your garage or outdoors on a concrete slab. During new home construction they can also be placed in a basement of the house. These units arrive completely assembled for easy installation. All you need to do is place and bolt down. 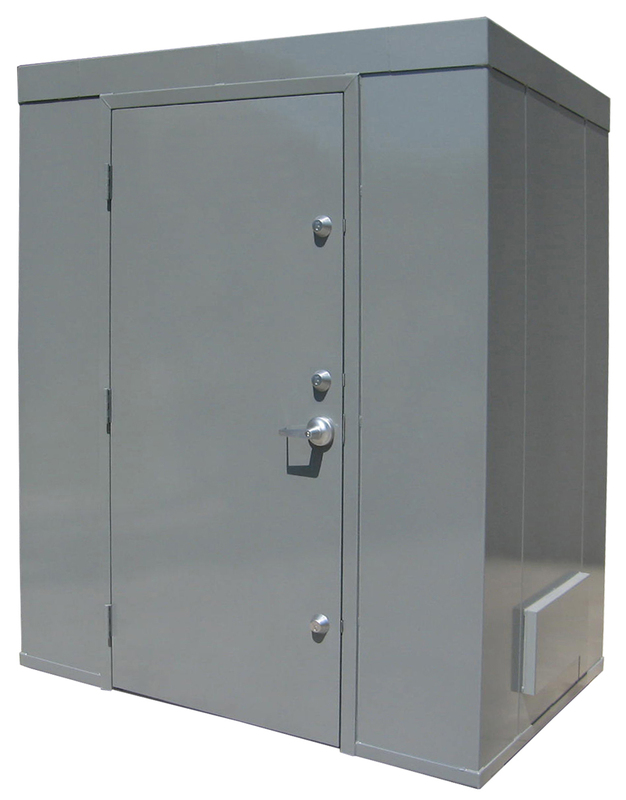 With heavy-duty bolt down anchors to hold it in place, and sturdy steel walls capable of resisting the strongest storm winds and debris impacts, these units provide emergency shelter when and where you need it, which during a tornado is HERE AND NOW!! 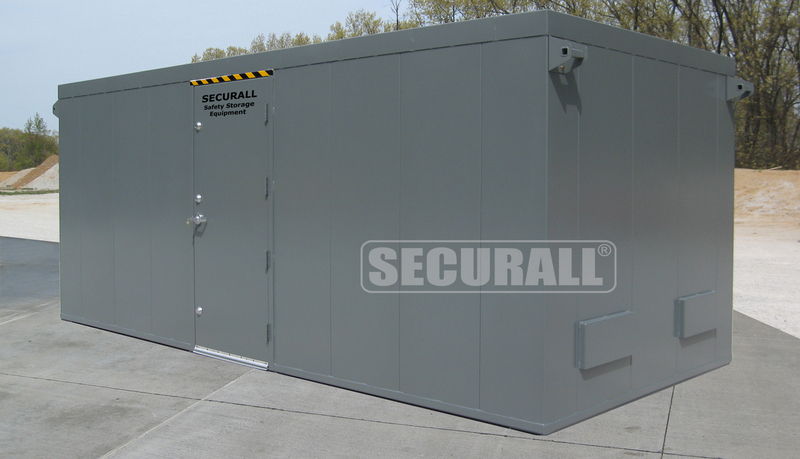 Securall manufactures Storm Shelters large enough to provide protection at offices, schools, trailer and RV parks, campgrounds, construction sites, public venues, etc. With enough room to safely house dozens of people during Severe Weather incidences these units are ideal for offering safety in otherwise vulnerable locations. On top of the peace of mind these units offer to those working and living near them, they also reduce the risk to human life and therefore stand to reduce your insurance premiums as well. Contact Securall for any questions or concerns regarding our Large Facility Tornado Safe Rooms today. 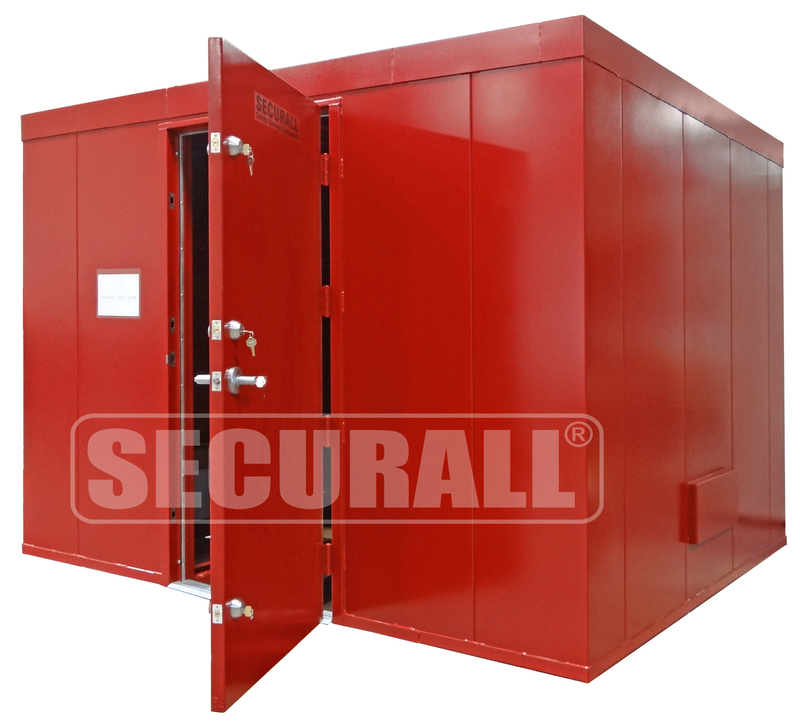 Securall Storm Shelters & Safe Rooms are built in accordance with specifications set forth by FEMA, the National Storm Shelter Association (NSSA), and the International Code Council (ICC). Our tornado shelters comply with the recommendations established in the documents: FEMA 320 - Taking Shelter from the Storm (written in conjunction with Texas Tech's Wind Engineering Research Center) and ICC-500. Securall Tornado Safe's FEMA 320/361/ICC-500 Proprietary Wall Assembly & FEMA 320/ICC-500 door assembly was tested and successfully passed missile impact resistance tests at Texas Tech University’s Wind Science and Engineering Research Center. Household/Commercial solid waste Storage Facility - Exterior solid waste storage enclosures are required for all new commercial solid waste service locations except those sites with alley collection, compactors, or an approved internal room for solid waste storage. Solid Waste storage enclosures may not be used for storage of any other materials except solid waste and all waste must be stored within the provided container. The storage, processing, and disposal of hazardous waste at municipal solid waste facilities pose a risk to public health and the environment, and in order to protect the environment and to provide measures for adequate protection of public health, it is in the public interest to require hazardous waste to be stored, processed, and disposed of only at permitted hazardous industrial solid waste facilities. "Class I industrial solid waste" means an industrial solid waste or mixture of industrial solid waste, including hazardous industrial waste, that because of its concentration or physical or chemical characteristics is toxic, corrosive, flammable, a strong sensitizer or irritant, or a generator of sudden pressure by decomposition, heat, or other means and poses or may pose a substantial present or potential danger to human health or the environment if improperly processed, stored, transported, or otherwise managed. "Class I nonhazardous industrial solid waste" means any Class I industrial solid waste that has not been identified or listed as a hazardous waste by the administrator of the United States Environmental Protection Agency under the federal Solid Waste Disposal Act, as amended by the Resource Conservation and Recovery Act of 1976. "Commercial hazardous waste management facility" means any hazardous waste management facility that accepts hazardous waste or PCBs for a charge, except a captured facility or a facility that accepts waste only from other facilities owned or effectively controlled by the same person, where "captured facility" means a manufacturing or production facility that generates an industrial solid waste or hazardous waste that is routinely stored, processed, or disposed of on a shared basis in an integrated waste management unit owned, operated by, and located within a contiguous manufacturing complex. "Hazardous waste" means solid waste identified or listed as a hazardous waste by the administrator of the United States Environmental Protection Agency under the federal Solid Waste Disposal Act, as amended by the Resource Conservation and Recovery Act of 1976, as amended (42 U.S.C. Section 6901 et seq.). 411-60 - Liquefied Petroleum Fuel Gas Storage - The liquefied petroleum gas, commonly known as LPG, for heating, metal cutting, brazing, in dental laboratories, aboard ships, and in similar installations. 411-82 - Contaminated Fuel Storage - A fuel storage facility requires temporary storage locker/building for off-specification (contaminated) fuel. 411-84 - Bulk (Depot) Heating Fuel Storage - Heating fuel oil storage may include storage tanks for kerosene and several different grades of diesel oil. Drum Heating Locker/Building - Buildings can be equipped with (6,143 BTU to 34,100 BTU) explosion proof heater. And then it can be used for melting, viscosity reduction, elevated temperature storage, and general process heating applications. Buildings can be installed indoors or out. These units feature integrated spill containment. Weight - Approx. 866 lbs. Weight - Approx. 1,113 lbs. Weight - Approx. 1,316 lbs. Weight - Approx. 1,665 lbs. Weight - Approx. 3,243 lbs. Weight - Approx. 3,997 lbs. Weight - Approx. 4,769 lbs. Weight - Approx. 6,278 lbs. Weight - Approx. 7,776 lbs. Weight - Approx. 9,295 lbs. 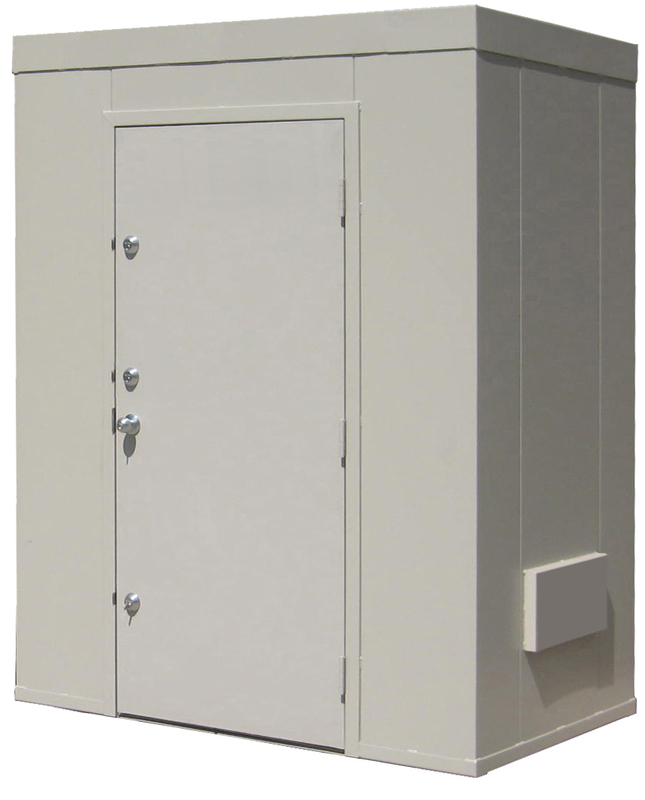 Securall® Tornado Safe Rooms are designed to be conveniently placed in your garage or basement. They will also work outdoors on a cement pad next to your house or barn, should you prefer. These units arrive completely assembled for easy installation. All you need to do is place and bolt down. 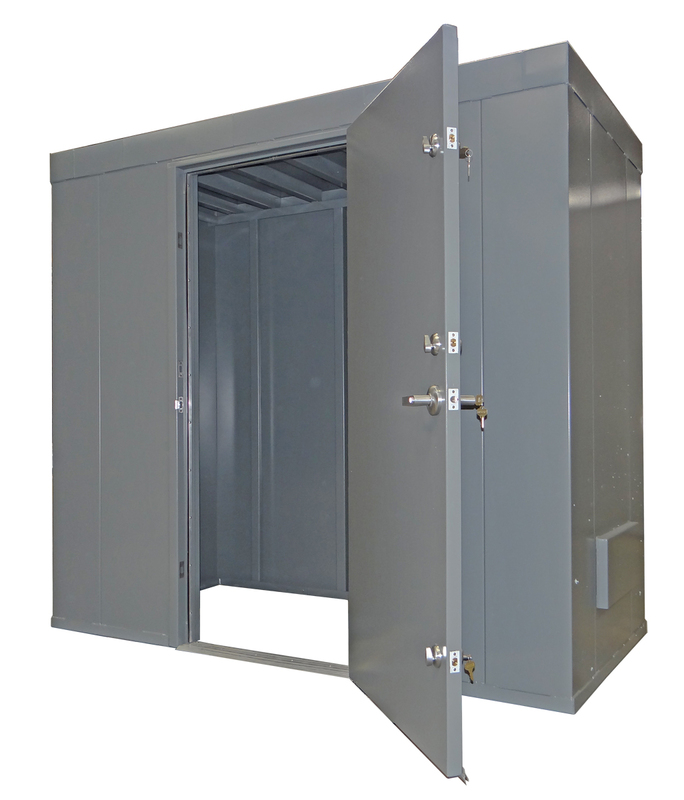 With heavy-duty bolt down anchors to hold it in place, and sturdy steel walls capable of resisting the strongest storm winds and debris impacts, these units provide emergency shelter when and where you need it, which during a tornado is HERE AND NOW!! SBA Disaster Loans - Homeowners who receive a disaster assistance loan from the U.S. Small Business Administration (SBA) to repair or rebuild a damaged or destroyed home may use some of the loan proceeds to construct a safe room. The SBA can also increase the approved disaster loan by up to 20 percent to cover the cost of adding a safe room. Community Development Block Grant Funds - On December 3, 2003, the President signed into law the Tornado Shelters Act (Public Law 108-146), which amends the Housing and Community Development Act of 1974, authorizing communities to use community development block grant funds to construct tornado safe shelters in manufactured home parks. To be eligible, a storm shelter must be located in a neighborhood or park that contains at least 20 units, consists predominately of low- and moderate-income households, and is in a state where a tornado has occurred within the current year or last 3 years. The storm shelter must comply with tornado-appropriate safety and construction standards, be large enough to accommodate all members of the park/neighborhood, and be located in a park/neighborhood that has a warning siren. Community development block grant funds are funded through HUD. Tornado Safe Rooms & Shelters also work great as secure storage units. Their fully welded construction and heavy duty door with 3 locking mechanisms make a durable and tamper-resistant place to store your valuable possessions or secure your guns and other weapons from unauthorized persons. The spacious inside dimensions allow for the storage of items too large for standard home safes. 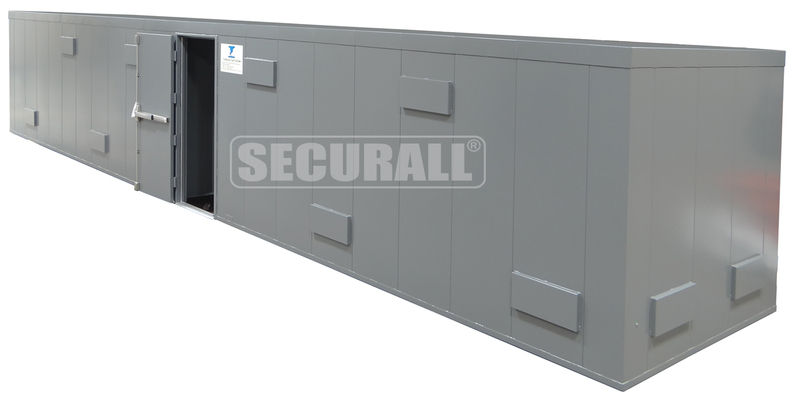 Securall Tornado Safe's FEMA 320/361/ICC-500 Proprietary Wall Assembly passed three impacts and meets both the FEMA 320 and the ICC-500 standards for wall systems in storm shelters . The tornado test criterion uses a 15-lb. 2x4-in. wood board traveling horizontally at 100-mph, which corresponds to a 250-mph wind, and is the criterion used in designing vertical surfaces for occupant protection. Pressure and Impact tests were conducted at Texas Tech University’s Wind Science and Engineering Research Center. The test on FEMA 320/ICC-500, Model HD42x84-O-LH was consistent with the guidelines of FEMA 320/361 and ICC-500 (2008) Standard for “The Design and Construction of Storm Shelters” and the ICC-500 requirement that the pressure test load should include a safety factor of 1.2. This pressure relates to a 250 mph ground speed tornado and the door installed in Zones 4&5 per ASCE 7-05 for a corner zone with the negative pressures being greater than the positive pressures. The goal pressure is 2.19 psi which must be held for 10 seconds in accordance to ASTM E330. In accordance to FEMA 320, the residential shelter guideline, swinging door assemblies should resist a static pressure of 1.37-psi for a 5-second period. The tornado test criterion uses a 3 impacts of 15-lb. 2x4-in. wood board traveling horizontally at 100-mph, which corresponds to a 250-mph wind. FEMA 320/ICC-500, Model HD42x84-O-LH door assembly passed 2.19 psi for 10 sec. (includes ICC-500,1.2 Safety Factor) & three impacts and is qualified to meet both the FEMA 320 and the ICC-500 standards of door pressures and impacts for doors in storm shelters. Heavy-duty bolt down cement anchors secure the unit in place. 2 vents (high and low) with welded vent covers for fresh air flow and to reduce the build up of air pressures. 36”W heavy duty steel door with standard lever handle and 3 dead bolts (All keyed alike), built to FEMA 320. Finished in grey polyurethane enamel. Custom colors are available. Shipped fully assembled. Easy to install with turn-key operation - simply place, bolt and use. Homeowners who receive a disaster assistance loan from the U.S. Small Business Administration (SBA) to repair or rebuild a damaged or destroyed home may use some of the loan proceeds to construct a tornado shelter. The SBA can also increase the approved disaster loan by up to 20 percent to cover the cost of adding a safe room. On December 3, 2003, the President signed into law the Tornado Shelters Act (Public Law 108-146), which amends the Housing and Community Development Act of 1974, authorizing communities to use community development block grant funds to construct tornado safe shelters in manufactured home parks. To be eligible, a storm shelter must be located in a neighborhood or park that contains at least 20 units, consists predominately of low- and moderate-income households, and is in a state where a tornado has occurred within the current year or last 3 years. The storm shelter must comply with tornado-appropriate safety and construction standards, be large enough to accommodate all members of the park/neighborhood, and be located in a park/neighborhood that has a warning siren. Community development block grant funds are funded through HUD. On January 14, 2000, as part of HUD/FHA’s continuing efforts to be responsive to public safety concerns, HUD began allowing borrowers to include windstorm shelters as an eligible work item for FHA 203(k) rehabilitation loans and FHA 203(b) financed new construction (see HUD Disaster Recovery Assistance). Shelters financed with FHA-insured mortgages must be constructed consistent with the guidelines presented in FEMA publication 320 and the National Performance Criteria for Tornado Shelters. Hazard Mitigation Grant Program Funds FEMA's Hazard Mitigation Grant Program (HMGP) assists states and local communities in implementing long-term hazard mitigation measures following a major disaster declaration. As of November 1, 2004, all communities must have an approved hazard mitigation plan in place to remain eligible for HMGP funding. HMGP grants can be used to fund projects that provide protection to both public as well as private properties. Projects that are eligible under the HMGP grant include (but are not limited to) acquiring and demolishing or relocating structures from hazard-prone areas; retrofitting structures to protect them from floods, high winds, earthquakes, or other natural hazards; and constructing residential and community shelters in tornado-prone areas. FEMA can fund up to 75 percent of the eligible costs of each project. The state or local match does not have to be cash; in-kind services or materials may be used. Federal funding under the HMGP is based on 7.5 percent of the Federal funds spent on the Public and Individual Assistance programs (minus administrative expenses) for each disaster. Eligible applicants must apply for the HMGP through the State Hazard Mitigation Officer (See the HMGP main page). Pre-Disaster Mitigation Program Funds [Read More] FEMA's Pre-Disaster Mitigation (PDM) Funds provide both planning and project funding to eligible communities. Communities must complete an approved hazard mitigation plan by November 1, 2004, to remain eligible for PDM funds. PDM project funding is nationally competitive; there is no "base" amount guaranteed to each state. A national priority is placed on projects that address National Flood Insurance Program (NFIP) repetitive loss properties and a benefit cost analysis is required for each proposed project. Projects are awarded priority based on the state's analysis and resulting ranking, and on factors such as cost-effectiveness, addressing critical facilities, and the percent of the population that benefits from the project. FEMA funds up to 75 percent of the cost of the project, or up to 90 percent for small, impoverished communities. There is a $3 million cap on the Federal share of the cost per project (See the PDM main page). 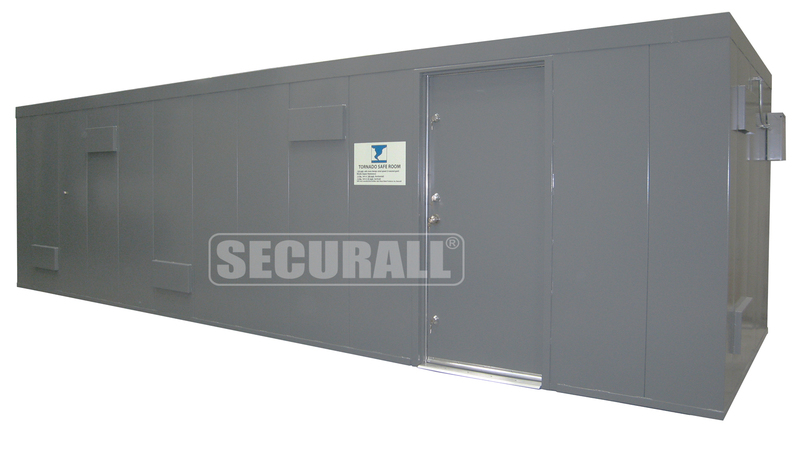 Securall FEMA Shelter Doors are constructed in accordance with Federal Emergency Management Agency (FEMA 320) recommended design specifications. The design is based on extensive research of the causes and effects of windstorm damage to buildings and should provide a high degree of occupant protection during extreme windstorms (tornadoes and hurricanes). 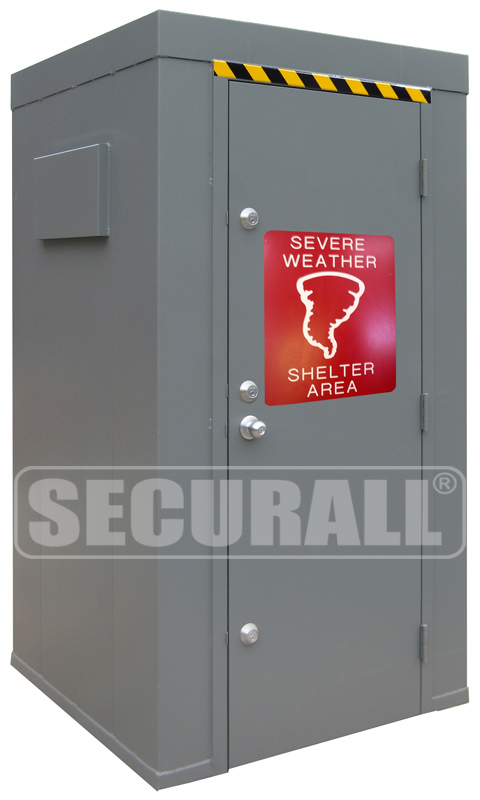 A Securall® FEMA Shelter Door is a critical element when designing a safe room for protection against severe storms. Strong tornadoes have resulted in loss of the floor framing, collapse of basement walls and death and injuries to individuals in the basement. By having a safe room in your home, you can protect your family and save the lives of those you care about. For more information on safe room designs and construction, please refer to Http://www.fema.gov/plan/prevent/saferoom/fema320.shtm. 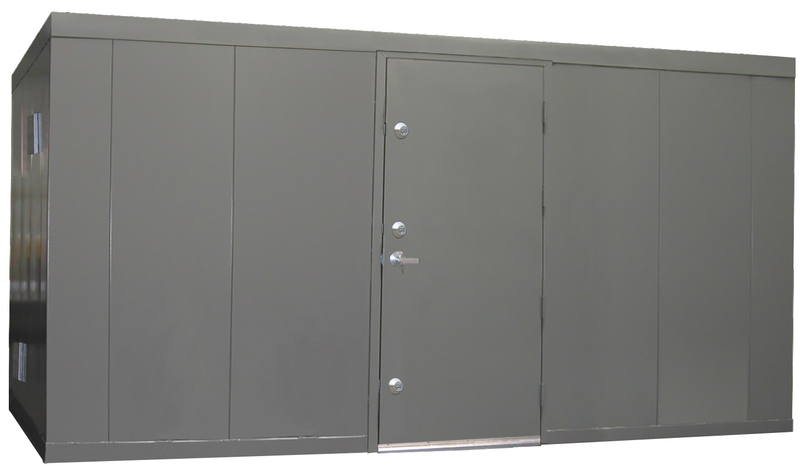 FEMA Shelter Door Standard Features: 36" Wide x 80"H Door (Overall Dimensions, including Frame: 40"Wide x 82"H) . StormSafe® Door Pressure & Debris Impact Test at Texas Tech: Pressure and Impact tests were conducted at Texas Tech University’s Wind Science and Engineering Research Center. The test on FEMA 320/ICC-500, Model HD42x84-O-LH was consistent with the guidelines of FEMA 320/361 and ICC-500 (2008) Standard for “The Design and Construction of Storm Shelters” and the ICC-500 requirement that the pressure test load should include a safety factor of 1.2. This pressure relates to a 250 mph ground speed tornado and the door installed in Zones 4&5 per ASCE 7-05 for a corner zone with the negative pressures being greater than the positive pressures. The goal pressure is 2.19 psi which must be held for 10 seconds in accordance to ASTM E330. In accordance to FEMA 320, the residential shelter guideline, swinging door assemblies should resist a static pressure of 1.37-psi for a 5-second period. The tornado test criterion uses a 3 impacts of 15-lb. 2x4-in. wood board traveling horizontally at 100-mph, which corresponds to a 250-mph wind. Test Results FEMA 320/ICC-500, Model HD42x84-O-LH door assembly passed 2.19 psi for 10 sec. (includes ICC-500,1.2 Safety Factor) & three impacts and is qualified to meet both the FEMA 320 and the ICC-500 standards of door pressures and impacts for doors in storm shelters. ** Building may require State Approval. Please check with your Local Authorities to determine if State Approval is required.